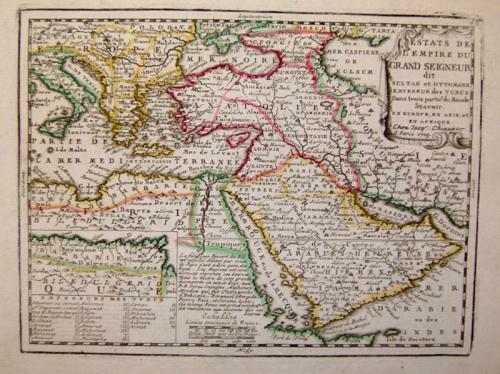 The map shows the extent of the Ottoman Empire from the Balkans to Persia, including all of Arabia and North Africa (an inset map at lower left shows the continuation of the African coast to present day Algeria). There is a short text on map regarding the Nile and its source in Ethiopia. In the bottom right hand corner is a list of Turkish rulers. Unusually, included with the map is an additional explanatory sheet of the engraving. The map is in excellent condition.